In Japanese lore, fox-spirits are able to assume human form and maintain close relationships with people for certain periods of time. “Fox-fires” [kitsu-nebi] such as the three seen here in the top section, always indicate something supernatural going on. In this instance, a popular kabuki dance scene from the play, Hanayagura hitome senbon [Thousand Glances from the Flower-viewing Point], captures a moment in Act 2 when a fox disguised as the loyal samurai retainer Tadanobu begins transforming during a shrine’s drum-playing celebration, where it involuntarily dances its way back into a fox. The actor is shown dressed in samurai armour and holding a horse’s saddle, while he performs a kitsune roppō [fox in six directions]. Roppō is the term for a dynamic, explosive dance in kabuki theater. The six directions refer to north, south, east, west, and also heaven and earth, so the description characterizes dance movements so expansive they must contain all the directions in the world. After being recognized as a true hero in subsequent scenes, the fox does return to the animal world. The actor Nakamura Shikan II (1798-1852) performed this fox role at the Naka Theater in Osaka during the 5th month of 1835. He was famous for his large, imposing good looks as well as his dancing skills and was billed as an all-around actor, a sort of “man of a thousand faces.” This luxury print’s portrayal of Shikan II is one of the artist’s most sought-after prints, among an oeuvre almost exclusively dedicated to full-length figures of actors in their famous roles. The curatorial notes from the Victoria and Albert Museum read: "As evidenced in this work by the early 19th-century artist Hokuei, dramatic power and energy characterised the theatrical prints of Osaka. This particular design depicts the end of the Fushimi-Inari Shrine scene in Act 2 of a play staged at the Naka-za Theatre in Osaka in May 1835. The play seems to have been a version of the highly popular Yoshitsune Senbon Zakura (Yoshitsune and the 1,000 Cherry Trees). Yoshitsune parts with Lady Shizuka at the shrine and leaves with his party. A sorrowful Lady Shizuka leaves the stage, and finally Nakamura Shikan II as Tadanobu makes his exit by the hanamichi (walkway). Tadanobu here is actually a fox who will loyally accompany Lady Shizuka to Mt Yoshino." A close up detail of this print appears on the cover of Stars from the Stage in Osaka: Early 19th-century Japanese kabuki prints by Matthi Forrer. It is illustrated in a full-page color reproduction on page 36 and again in black and white on page 65 with the accompanying text. 1. In Ikeda Bunko, Kamigata yakusha-e shūsei (Collected Kamigata Actor Prints), vol. 2, Osaka, 1998, no. 352. 2. In color in Impressions of Ukiyo-e by Dora Amsden and Woldemar von Seidlitz, 2007, p 34. 3. 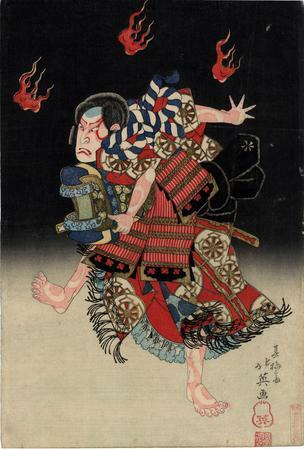 In color in 原色浮世絵大百科事典 (Genshoku Ukiyoe Daihyakka Jiten), vol. 9, p. 124. 4. In a small black and white image in Masterpieces of Japanese Prints: The European Collections - Ukiyo-e from the Victoria and Albert Museum, Kodansha International, 1991, p.33 and in color on page 132.